Crumbs, great minds think alike and all that... I've been trying some tests at -3dB gain. Essentially, I want to get better chromakeys from 'thrown together setups' (for example, a talking head shoot's location has to be changed at last minute due to ugliness/noise/politics). Happens a lot in my world. EX1 is, well, noisy. Not nasty noisy, just has a 'grain'. But this needs to be surpressed in chromakeying as it can lead to a little bit of 'boil' in the key, which - if you sit on it hard - means your keys are more abrupt and less subtle. So, threw together a chromakey setup. Had an EX1, a Ninja and a patient subject. I'm pasting it together right now. 4:2:2 Ninja at ProRes HQ should be visibly better than 4:2:0 XDCAM? 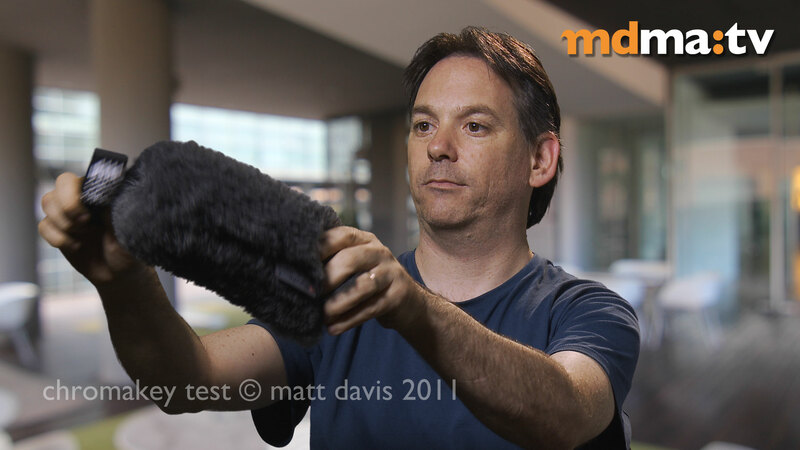 Jury's still out because I'm currently using DVmatte Pro, which is a hybrid keyer. It prefers the XDCAM. Later on, I'll try other traditional chromakeyers. But, but but... noise. There is, of course, no difference in boil and noise between the XDCAM and the Ninja records. I am seeing, and I may be really wrong and guilty of some sort of statistical 'I want to see a difference' error, but I really do think there's less noise in -3dB footage. Noise is still there, but not as aggressive. Now, -3dB gain shunts the EX1 exposure graph down a bit, so we're into a danger whereby extreme shadow detail gets posterised like highlights would get burned out. But hey, for chromakey, we're in controlled circumstances, where we can raise ambient light (or - egad - lower lighting levels so ambient gets a better showing). But that -3dB noise floor comes at quite a penalty: where we might shoot at f4 (lower end of lens sweet spot), suddenly we're at 2.8 and then only just. Still working out whether it's worth raising the light levels, sticking with what I've got, or doing chromakey work on a large sensor camera. Russ: Doug's idea of using a grad to reduce the intensity of the moon is a good one. You might also want to consider using a slow shutter to boost the sensitivity without resorting to gain. It's going to be a tough one to get right. Matt: My experience of ProRes is that I think it adds noise during the initial encode to ProRes somewhat negating the small benefit gain by going to 4:2:2. I did some chroma key tests keying with the EX when I first got it and I didn't (at that time) think going to ProRes was worth the extra effort. Of course now it's much easier to record ProRes or other 4:2:2 codecs. 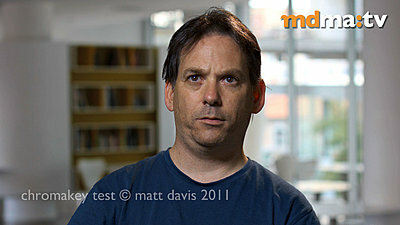 I have had good Chroma key results with the NanoFlash at 100Mb/s, but it's not a massive difference. Don't forget that if you are shooting talking heads you can always shoot portrait with the camera on it's side in effect increasing the resolution (and decreasing the size of the problem areas) once the person is composited into the background, it's well worth doing if you can, it's kind of like shooting at 4k and then shrinking it down to HD. Not only does it make the edges finer, but the noise grain gets finer too. I assume your already using progressive for your keying as this gives the best result. Turning off the detail correction tends to give a slightly cleaner key IMHO. If you want to keep the detail on, try setting the crispening to -99, this forces correction of low contrast edges such as the key edges, although it will slightly increase overall noise. Interestingly, if I turn detail off in the picture profile, then added sharpening in post (which works well with scenics and where in-camera sharpening is too heavy handed), the sharpening finds all the latent noise in the image and looks awful. So in this case, my tests seem to show that I'm getting better results sharpening in-camera in this situation. Agree crispening down to the big minus area will stop it getting its grubby paws on too much of the image! The 90 degree trick is great - and so looking forward to the FS100 rather than all the 'tripod yoga' it can require without expensive custom bracketry. Don't get me wrong - results so far have been okay, but would have preferred to lose the tell-tale 4:2:0 you can see in the hair and around the dead cat. Ah well, test and test again. Test early, test often. Crispening at -99 will increase the detail correction in low contrast areas, this can help sharpen up the key edges as these are normally low luma contrast. A positive cripening number raises the detail application threshold so will reduce the appearance of noise. It's a trade-off, better key or less noise.